I’ve written about this before, but Forbes recently wrote a couple awesome pieces taking down San Francisco’s Academy of Art, really spelling out why for-profit art schools are such an overpriced scam. And they are. The ‘Starving Artist’ is a thing. Don’t compound it with debt. For-profit schools will promise you anything to get you to take out a federally backed student loan. You can’t bankrupt yourself out of that loan so it’s guaranteed money to the school. They could care less if you succeed. They will certainly promote those few students that do succeed in a big way, but most end up like our former admin assistant: Academy of Art Photography degree, a ton of debt, and a $15/hr job as an admin assistant. And those that are successful, would be successful anywhere because they have the right mix of work ethic, skills, and talent. Especially the work ethic. So don’t get caught up in the supposed ‘prestige’ (i.e. marketing budget) of a for-profit school or other expensive school. It’s an illusion. Expensive tuition does not mean better results. You’ll do just fine at a community or state college. Ultimately, it’s your work ethic and demo reel that will make you successful. You’ll learn more in 3 months of an internship than a year in school. It’s also something that will stand out on your resume MUCH more than where you went to school. Make it happen. The jobs you’ve had are what sells you. Spending $100K on a filmmaking or VFX degree is usually just a good way to get entry level jobs. There are much cheaper ways to get entry level jobs. To get internships (and entry level jobs), you’ll need to do a lot of work on your own. But if you’re really into editing, vfx, or whatever this should be something you WANT to do. You should be totally into the type of work you’re trying to get. If you’re working on a personal project and you look up and realize it’s 4am because you’ve completely lost track of time because you’re so into what you’re doing that the time flys by…. that’s a really good indication you’re doing the right thing. So dig through as many online tutorials as you can, do lots of personal projects, get together with other students and do cool stuff. It’ll all get you to the point of having a reel you can use to get internships. One caveat: Just because someone is teaching it, doesn’t mean they’re right. With editing or visual effects there’s usually 10 different ways of doing anything and they’re all correct depending on the situation. For example, you’ll find the occasional colorist throwing an online hissy fit over digital beauty work using Beauty Box because they think it’s putting beauty artists out of work (yes, I’ve actually had an online argument about this) or it’s not true beauty work or whatever. However, you can use Beauty Box in many workflows and we have many excellent colorists that use Beauty Box for beauty work on feature films, high end music videos and national commercials. But some folks have _their_ way of doing something and feel that’s the only way. Don’t be like that. Be flexible and you’ll be a better artist (not to mention being able to work with different time/budget constraints). The other benefit of internships is you get to meet people. This is critical. Of course, there are many other ways of meeting people. Go to user groups, join professional meetups, anything where you can meet folks that are doing what you want to do. It’s a good way to get internships, jobs, and good advice. And you need to promote yourself. Most artists don’t get into doing art because they enjoy sales, but that is the business side to the industry. You need to talk about yourself or, at least, what you’ve been doing. Make sure you have a business card, a web site with your demo reel on it, and examples of your work on your phone. The business side is every bit as important as your work when it comes to being successful. ALL schools tend to gloss over this. Art majors don’t want to take business classes. If you’re going to succeed, it’s critical that you understand the business side. Don’t give up and definitely follow up. If someone introduces you to someone that has a job/intern opening, follow up with them. Make sure they know you’re interested. Ask them if they need any additional information and don’t be afraid to ask for an interview. People want to hire folks that are proactive and show a willingness to make an effort. It matters. A lot. Even if there’s not a job involved, most people are willing to help you. But you have to be proactive about it. Don’t be annoying, but if you’ve interacted with them and gotten their card don’t be afraid to send them the occasional email updating them on new projects or things you’ve completed. So skip the high priced art school. Go to a community college or state college, go through every tutorial you can online, meet folks, do your own projects, get internships, and meet as many people as you can. That’s how you get the skills and contacts that will make you successful. Just get out there and do it. Get an entry level job (you’re going to get one anyways, degree or no) and work your way up. A school is just a good place to get feedback, get some project ideas, and meet like minded students. It doesn’t matter if spend $100/credit or $1000. Here’s another good article on the film school debate, rising film school costs, and the ever dropping costs of pro camera equipment. I’ve written about this before, but Thanksgiving came along this year and I left on a 5 day, two city trip without my Wacom tablet. Which reminded me exactly why I’m thankful for the tablet. I’ve used a Wacom tablet as a mouse replacement since around 2003. I used to run a user group called Bay Area Motion Graphics. 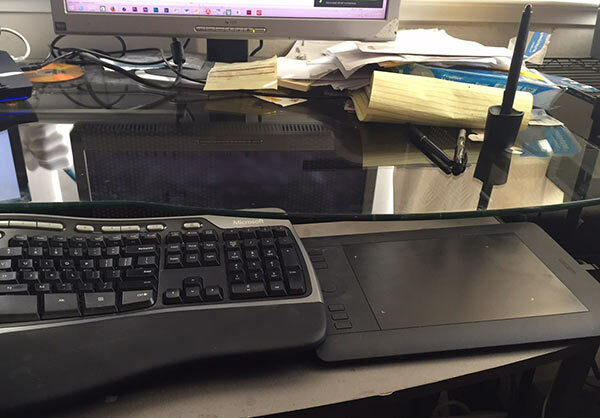 Because I and one other DA employee had RSI problems, I got a variety of ‘ergonomic’ devices and had DA folks and members of BAMG try them out. BAMG was mostly video editors and motion graphic artists, to give you some idea of who was using them. Extra space on your keyboard drawer, yes. Clean desk, no. We swapped around the weird looking keyboards, joystick mouse things, trackballs, tablets, and other oddments. We then got together and decided which devices seemed to offer relief to the most people. One of the devices that stood out, especially for me, was the Wacom tablet. Once you get used to using it as a mouse replacement it’s really an awesome device. I have multiple tablets and use them constantly in the office and while traveling. It makes using the computer much less painful. That’s in stark contrast to the last few days. No tablet, so I’ve been forced to use the track pad on the two computers I carry around. My wrists immediately started to ache and tingle. Not good. It’s amazing that for the most part I have no problems when using the tablets, but then after a couple days not using them, much of the pain comes back. Of course, RSI is a whole body thing. Not only do your wrists hurt, but you’re in a less ergonomic position (f’ing hotel chairs) so my shoulders and back hurt as well. Why are the Wacom tablets so effective for helping with RSI? I’m not sure to be honest. But I feel that 1) you’re holding the pen as you would a normal pen. This is a skill you’ve been working on since you were a small child and the muscle memory is very strong. 2) you’re not just using one body part over and over again (like your index finger on a mouse). You’re using your whole hand, wrist and arm. I feel like this distributes the stress over a greater area. Whatever the case, for me, the tablets have been a godsend. It takes some time to get really familiar with them, but it’s been well worth it for me. Of course, it’s just one part of having an ergonomic workstation but it’s a big one (a great chair is another big one). Your health is critical. Take care of yourself.